Gujarat Chief Minister and BJP's prime ministerial candidate Narendra Modi on Friday wrote letters to fellow chief ministers, urging them to oppose the Communal Violence Bill saying it was a blatant intrusion upon the powers of the state governments. 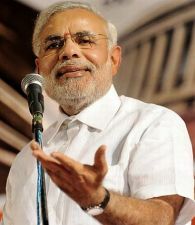 Modi had written to the Prime Minister Manmohan Singh on the issue on Thursday, calling the legislation as "recipe for disaster". The UPA government plans to introduce the 'Prevention of Communal Violence (Access to Justice and Reparations) Bill, 2013' in the ongoing session of the Parliament. In his letter, Modi has called upon his counterparts in other states to discuss the issue and oppose the Bill. "It is important for all Chief Ministers to rise beyond political affiliations and come together to oppose the Bill, which is nothing but a blatant attempt by the Centre to interfere with and intrude upon the powers of elected State Governments," Modi has said. The Bill would polarise the society and would introduce the idea of differential application of criminal law to citizens based on religious and linguistic identities, he has said, adding that it would demoralise public savants and impact how the state government can deal with law and order situations in future. The recipients of today's letter include Shivraj Singh Chouhan (Madhya Pradesh), Prithviraj Chavan (Maharashtra), Okram Ibobi Singh (Manipur) and Dr Mukul Sangma (Meghalaya) among others, officials said.